The Turkish Web Corpus (trTenTen) is a Turkish corpus made up of texts collected from the Internet. The corpus belongs to the TenTen corpus family which is a set of the web corpora built using the same method with a target size 10+ billion words. Sketch Engine currently provides access to TenTen corpora in more than 30 languages. Data was crawled by the SpiderLing web spider in December 2011 and January 2012 and comprised of more than 3.3 billion words in 12 million documents. This Turkish corpus was processed by TRMorph tool which provides part-of-speech tags and stems (parts of words without affixes). More information about the tool can be found in Bibliography. The trTenTen corpus is POS tagged with the Turkish TRMorph tagset. Ambati, B. R., Reddy, S., & Kilgarriff, A. (2012). Word Sketches for Turkish. In LREC (pp. 2945-2950). 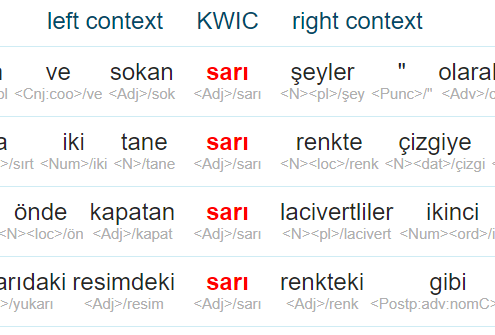 Sketch Engine offers a range of tools to work with this Turkish corpus.